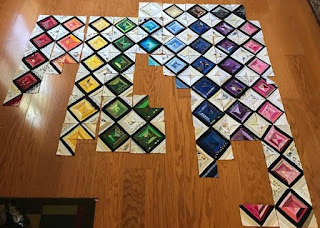 I love those string blocks - they're going to make a beautiful quilt! I hope all is well with your son's visit to Pittsburgh. I sure understand your worry. And, yes, can't wait for political ad season to be over with! Hope you're enjoying some Sunday afternoon stitching today! Oh boy, I do love those string blocks! Those string blocks look fabulous all playing nicely together. Hexies are a great travelling buddy, aren't they. Its so nice that you can spend some quiet time home alone like that on rare occasions. A balm for the soul, especially in these trying times. I know your guys will stay safe, but the timing and incident couldn’t have been worse. Yes, maybe tempers will cool after elections. We can always hope! Enjoy your slow stitching, Angela! Your string blocks are gorgeous! They are always a favorite of mine. 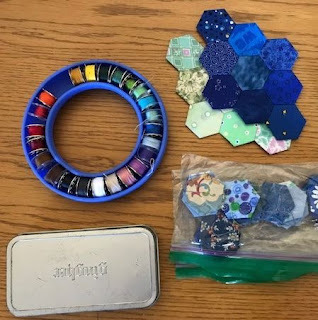 Thanks for sharing them with Oh Scrap! hahaha. I love that you posted about the hand sewing. I can completely relate. in my mind Epp sounds like a good idea and I enjoy it when I get going, but hard to get going with it. hugs. Your blocks look like faceted jewels to me.I’m struck that your son sends pictures of lampposts when he is away. Something touching about that. Are they day or night photos or a mix? If night, we certainly need the light in these dark times, don’t we? Beautiful strings, very unusual. Mstery to me: who are Kurt and Ryan and Sydney, and what crime scene? Was it near to you? 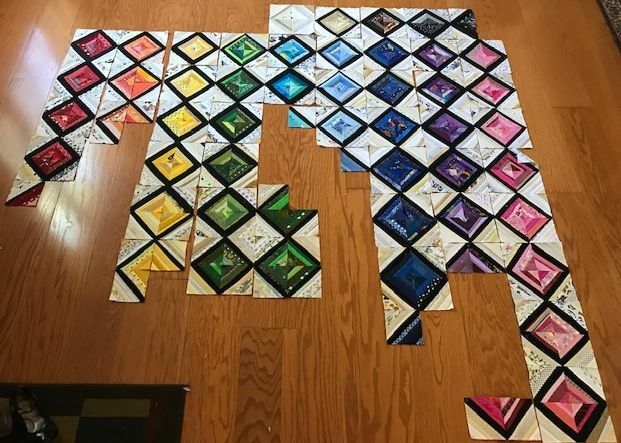 Your string blocks are looking great. Like the way you paired the colours with white fabrics. Really effective. Keep on sewing! Your evening alone sounds like my perfect evening alone! Especially the eating ice cream out of the carton--never gets old! Love the string blocks. I like the way you celebrate!! !